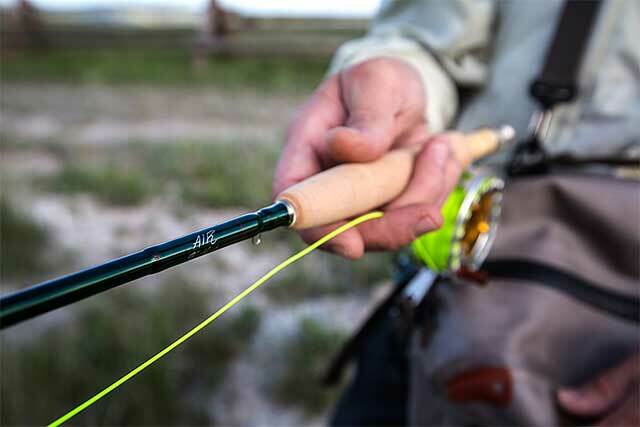 RL Winston tagged their new AIR as the “finest performing fly rod we’ve ever made.” That may very well be, but only if you play by the AIR’s rules…. Rule #1: Slow down your game. The AIR demands it. Widen that casting arc, relax your casting stroke, and as long as you’re at it, take more time to select that fly and to make your approach. It’s that kind of rod. While there are new ingredients in the blank recipe (3rd generation Boron, SuperSilica resin, more generically referred to as nano-silica resin on some dealer websites), the AIR is all about smooth power transition. Rule #2: The AIR was designed as a specific tool in a toolbox: use it accordingly. Finicky trout might not respond to offerings from rapid blanks – especially in the short range. While the AIR covers a broad casting range, it excels at positioning your fly with laser-like focus in the 15’ to 40’ range. This is a rod for anyone who obsesses about optimum delivery/accurate presentation. Rule #3: Expect more and get more: I believe that a rod’s finest attribute is its ability to communicate with the angler. The AIR model is one of the most fluid blanks currently available that boasts an exceptional recovery speed – which may seem slightly paradoxical – but Winston does make it possible: for those unaccustomed to highly fluid blanks, give the AIR the benefit of a little time and allow the rod to speak to you. This ultralight will greatly assist any angler – experienced or not – in tracking a fly, sensing a strike, even optimizing a cast for distance. Rule #4: Trout. You can certainly use it to take bass or panfish, but this is a classic trout rod. It’s the implement you take out of the toolbox when no other implement will do. Trout are deceptive, stubborn, at times skittish and generally challenging fish. AIR is the preferred tool if you want to introduce these fish to your landing net. The AIR is all about finesse, and I’ll drag out that tired cliché and state that it’s all about tiny flies and fine tippet (note that there is a 6 weight in the line for those targeting heftier fish). Your 7x tippet will have never felt better protected. Side note: the AIR is a very forgiving rod, and even though it is marketed as a premium fly rod, I would highly recommend it as a starter rod for anyone who can budget for it. See rule #1: the AIR will force you to slow down your cast, and it will allow that extra beat for you to consider your casting stroke, to develop and refine your timing, to obtain an improved visual understanding of how your line is acting and then optimizing your cast. Add up all of the above and the result is a premium fly rod that gives you stellar feedback: exactly what’s needed when targeting crafty fish. Do you count yourself among those who believe that presentation is everything? Then the AIR is well worth your consideration. Blank, hardware, build and finish are all top tier. See RL Winston website for full specifications. Available in weights 3 through 6.